Many parts of London, such as Islington or Highgate, were once villages (small towns). Today, London is a growing city with a population of more than seven million. People have come from all parts of the world to live here. They have brought with them different ways of living and colourful festivals. 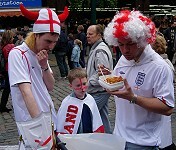 London is a multicultural city, as it has been since the Roman times. Now about a quarter of the capital's inhabitants are members of the ethnic minorities. 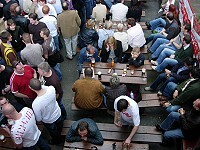 Residents of London are known as "Londoners". The Pearly Kings were the leaders of the Victorian street sellers. They got their name because they wore 'pearl' buttons on their hats as a sign of authority. Later they began to wear clothes covered all over in buttons. 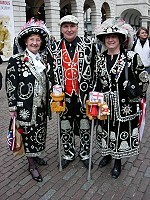 The title of Pearly King is passsed down in the family, and there are Pearly Queens, Princes and Princesses too. They now spend their free time collecting for charity. 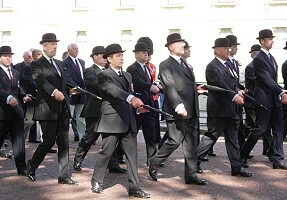 It is very rare to see men wearing bowler hats today. 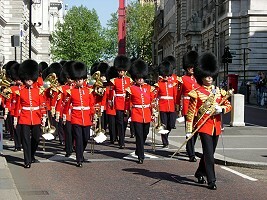 The men in the photo are taking part in a birthday parade for one of the Queen's Guard regiments. 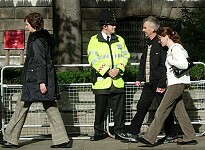 They stand outside London's exclusive hotels and shops wearing splendid uniforms, hailing taxis and opening doors for guests. Foot Guards guard the Royal palaces. They wear a red jacket and tall hats called bearskins. You can see them outside Buckingham Palace.